To keep it simple, it’s a basic FPV plane with a minimal flight controller for stability assist and Return To Launch. Few “fancy” features and no separate telemetry. Basic flight information is returned to the ground on the video OSD. Although a small and light-weight machine, the feature list is long. Waterproof for flight in rain. I always have some sort of application in mind even if not achieved. There must be some useful purpose and maybe certification under Part 102 of the new UAV rules. The CG adjuster is just for set-up. A motorised weight moved manually while flying. It allows the CG and control surface trims to be set in flight and recorded for best flight efficiency. The main controller supplies power and one RC channels to the payload. One analogue voltage from the payload is fed back to the OSD. The payload drop could be as simple as a couple of rails below and over the centre of the wing. Releasing the payload simply allows it to slide off the back (motor on the front). Moving the payload on the rails sets the CG correctly for each payload. A safety pin would prevent dropping of payloads that were not supposed to be dropped. Audio sent audio back on the FPV audio channel would be useful for tracking and searching. Having a cruise speed of 60-70 KpH and endurance of 1 hour + would make it useful for searching or audio feedback from payloads. For the flying wing platform see Here. Image from RC Wing CG Calculator – Here. To view full size; mouse-over image, right-click and open link in new tab (or your browsers equivalent. Everything except the payload is inside the wing which requires low profile equipment, especially the batteries. The motor is a larger diameter than I would like and needs a suitable mount point on the nose. A folding propeller prevents damage on landing and improves glide efficiency. The FPV cameras are in the wing leading edge outside the prop arc. Being a wing, the control surfaces are elevons. Having two elevons on each wing or adding flaps introduces interesting control possibilities. At the cost of hinges and 2 more servos. The outer surfaces will provide standard elevon control. The inner surfaces can possibly be used to oppose the outer surfaces for braking. It is probably worth building in 4 control surfaces, even if only the outer two are used initially. That leaves about 400g for the wing and misc other bits. I expect the estimated weights are very generous and it should easily come in under 1Kg. The weight savings by putting parts on one board is very good. The board itself will weigh no more than 25g. Each major function built directly into the board, OSD, LED-controller, tracker, power-control etc. adds only 2-3 g.
One of the biggest problems will be allocation of RC channels. I want to keep it to 8-channels so that I can use it with standard radios particularly my favourite 9X running ER-9X firmware. There are far too many functions and options to allocate a channel to each. One way to simplify this is to combine functions into states and flight modes. Channels 5,6,7 are 5-position switched, A,B,C,D,E = 1000, 1250, 1500, 1750, 2000 mS.
Interactions between modes need to be considered. Drop payload – A safety pin or interlock prevents accidental dropping of payloads that are not supposed to be dropped. A trigger sequence is required to drop on command (not sure what exactly, yet). Deploy chute – This requires manual flight mode and motor off. 5 minutes after the chute deploys, main power is switched off and the tracker activated. Loiter – has the plane orbit the current GPS location but can be manually pushed-about to a new location. Home-1 – take-off location, Home-2 – backup destination in case Home-1 becomes unavailable. Upon RTL reaching home it will Loiter around home. Upon running out of power, an automatic parachute landing will be attempted with power-off and tracker activation.. The motor is a Quanum MT3110-470KV (573000048-0) from HobbyKing. Rated at 470KV and 18 amps peak. ESC is a BLHELI-30A-Opto (narrow pcb, also from HobbyKing. Lower KV spins the prop slower for a given voltage, allowing a larger prop without overloading the motor. A larger prop spinning slower is more efficient, reducing battery punishment and increasing flight times and extending battery cycle life. Looking at the E-Flight calculator, Here, suggests that a 9×6 APC-E prop will provide approximately : 900g thrust at 8 Amps on 6-cell for a top speed of about 90KpH at 9000rpm. Probably a good starting point and balance between performance and efficiency. To begin with, a prop in the 8×8 to 9×6 range should work. 8×8 providing more speed but less thrust (110K/600g) and 9×6 less speed but more thrust (??,??). Up to about 11×8.5 could be used before overloading the motor (100k/1200g) . The plan is to use 6-cell or equivalent. The higher the voltage the better as it reduces current and improves efficiency. More than 6-cell adds problems with ESC and motor selection. I considered NiMh for a while. They are quite robust and offer a lot of charge/discharge cycles. There are some robust RC car packs available in various mAh ratings, as well as AA and AAA sizes. Any AA cells above 2000 mAh are almost certainly not real or not up to the job. I suspect that one string of AA 2000mAh would have trouble with the peak currents, Paralleling a second string would help , but adds too much weight. AAA cells are only good up to about 900 mAh so 2 or 3 strings would be needed; too many cells and connections.. The main problem with NiMh is the weight, about twice that of LiPo. Another disadvantage is 3x the number of cells, increasing the failure risk and difficulty of maintaining cell balance. The wing will have a thickness of about 20-25mm in the most useful section. This won’t fit 3-cell LiPo packs without adding clearance bumps on the top of the wing; complicating design and construction. Two 3-cell LiPo packs surgically re-arranged to lay flat, 3 cells in each wing side should work. The cells could be stuck to a card and slid into a pocket in each wing from the centre opening. The pack would then be only about 8mm thick. The pocket can be put in the foam before vacuum bagging with a block installed just to stop it caving in under vacuum. This also spreads the load/stress on the airframe as the batteries can be almost half the total weight. Pocketing the foam with removable blocks also makes spaces for the other gear without having to vacuum bag a complex shape or more follow up work after glassing. Just don’t glue the blocks in during glassing. This could allow the packs to be left in the plane, even during charging. Just requires 2 or 3 planes to stay in the air. At the moment I am planning one central Circuit Board to mount and interconnect all of the on-board equipment except for the batteries, servos, cameras, LEDs and antennas. I have used the Multiwii controller on multi-rotors and see that it has a fixed-wing set-up. I would like to stick with Multiwii but I’m not sure how well it flys a plane. I suspect it works or can be made to work, so will give it a go. As I’m planning to design the PC Board I can build most of the electronics directly into the board, and just mount the ESC, V-TX and a few smaller modules as daughter-board modules. Modules one side and smaller components on the other will keep the size and weight down. The board should work in any plane that can be flown with throttle and up to 4 servos. To save time and fiddly design I bought some 10-DOF sensor boards for the Multiwii; NZ$15 ea. on Ebay. I can cut-and-paste the rest from existing designs. This also means I can go back to my original simple DIY-OSD with big text. The Minim OSD may be more versatile, but I don’t need the extra complexity. The first one will take a bit longer, but then I should be able to knock up duplicates very quickly. Note: There are at least 8 micro-controllers on the main board, The largest being the flight controller. The reason for so many is that it simplifies the use of existing hardware and firmware blocks, or modules. It does not significantly add to the complexity weight or size of the board overall, but does reduce development time. Because of the requirement to fly in rain and because heat kills electronics like the the ESC and video transmitter, cooling is an important consideration. At the moment, the plan is to remove the standard ESC covering and heat-sink and attach a small brass tube. Outside air (and rain) can be ducted through, cooling the modules without compromising the water proofing. A simple, light weight solution using a bit of silicon tubing and a couple of bits of 3mm ID brass tube of about 30mm long. The brass tube can be soldered directly to the video transmitter. The ESC is a little more tricky to attach to pick up heat from the mosfets without adding extra weight. Maybe just heat-shrink a thin spreader plate soldered to the brass tube, with some thermal paste. Consideration must be made to shielding the electronics to reduce emissions and from the effects of strong external RF sources. The weight must be kept down, but small shielding cans could be used over the top and bottom of the RC receiver; or at least allowed for as part of the pcb design. The entire control board can be shielded within the fuselage using a foil or mesh screen around the central cavity. All low-power and signal wiring attached to the main pcb should include filtering on-board. This section gets a bit technical. Mostly my notes prior to detailed schematic and pcb layout. I was thinking of using the Corona DSSS 8-channel receiver with 2 clover-leaf/skew-planar circular polarised antennas. The reason being that this system was the most reliable and robust of those tested when tested against 2.4GHz wifi band jamming. The first decision is whether to use the Atmel ATMega CPU, Arduino and standard Multiwii. The other huge consideration is the IDE, is it tied to a OS, particular Browser, App or other tool, and will it still be usable in this form in 5 years ? It must also be reasonably user friendly and not require 10 years programming experience to get it working. The Arduino ATMega is much less capable than a small ARM CPU, like the STM32, But, running Arduino and standard Multiwii is a huge advantage. Arduino is simple and Multiwii has matured well, it works and should not be too stressed running a plane that does not require the update rates of a multi-rotor. More recently: it is now possible to use the Arduino IDE with the STM32F103 CPU. This greatly increases the processing power available and the STM32 includes some nice hardware features. The down-sides are that it will require more work and there would likely be some effort required to get a suitable version of Multiwii running in the STM32. 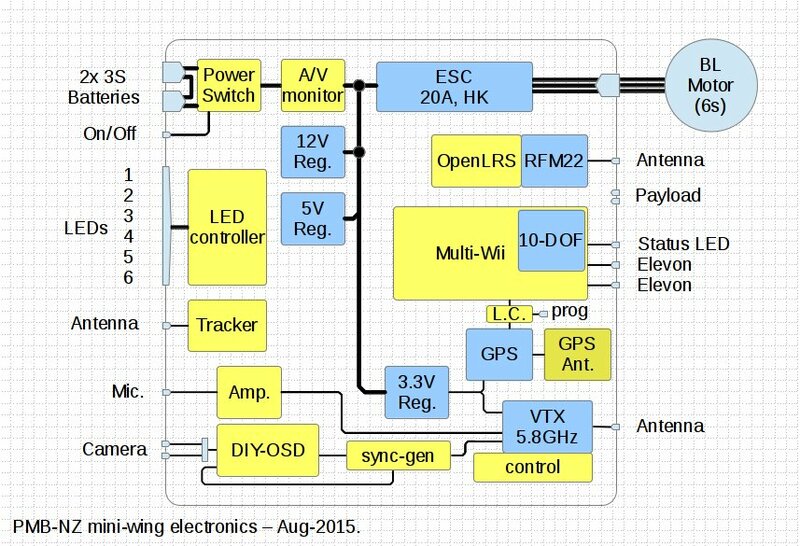 Thinking of Naze32 boards and their firmware – how they work, not actually using one. So. I think Multiwii with some minor changes and running in a STM32F103 it is. 3 UARTs – 1= bootloader/wifi module, 2 = GPS, 3 = ?? output compare – 8 (4017) servo outputs, elevons-1 and 2, flaps, throttle, LED control, payload-drop, chute-release, ?? Using a serial CPPM input from the receiver and 4017 servo driver frees up CPU pins and allows easier hardware timer control over pulse lengths without too much software overhead. The OpenLRSng receiver can supply a single CPPM output to the flight controller. STM32 based firmware used in Naze32 boards. I am not very familiar with these but have read and heard that they are generally not very good with GPS functions or fixed-wing control. This may change, but there is not as much interest in fixed-wing autopilots as there is is multi-rotor control. From what I see, there are various forks or versions of code that runs on Naze32 type hardware. There are also various configuration GUIs and a Chrome configuration App. This may all be cutting edge today, but will likely be very different in 2-3 years. FPV-Lab discussion “NAZE32 for fixed wing” : HERE. A miniature serial flash memory chip connected to the flight controller (SPI) can log flight data. 1M-Byte costs about $1, so why not. Logging position, altitude, speed, battery and a few misc. parameters every second or two, should record a complete flight. Another possibility is to use a micro-SD card; same interface, more capacity, but larger size. Low cost modules exist for both and could connect to the flight controller via UART. Bluetooth is limited to about 30 meters range. WiFi could operate out to 1 or 2 KM with a suitable antenna. There is a very useful Android App. for the Multiwii. I wonder if the Android App can connect via WiFi rather than Bluetooth. The App greatly simplifies configuring and pre-flight checks. 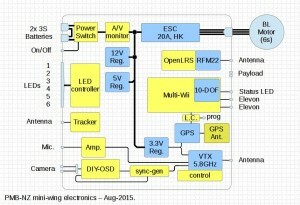 The best solution may be to design the board to accept either the Bluetooth or Wifi modules. Power control allows the batteries to be left connect for long periods. It also allows the flight controller to switch off all power to the model, except to the lost model tracker (which has its own 3V CR2032 battery) in the case of remote landings or loss. Power is switched on by push button or plug/key only. When off, power draw is very low; only the power control micro is running in a very low power mode. Batteries can be left connected almost indefinitely. The small embedded PIC-micro has control over the main system power. This provides push-button on-off control and allows the flight controller to switch the whole system off. Note: the separate tracker beacon is included rather than using the LRS, because it is self contained, more robust and uses less power. Current and voltage are monitored and voltages representing each are fed to the flight controller and the OSD. Maximum current is set to 20 amps, any higher for more than a second is considered an overload. Maximum voltage is about 26V (6-cell). The GPS is simply a Ublox module mounted directly to the main board. Antenna power is provided for active antennas. The flight controller must be able to configure the GPS module; none of this setting it up on another system before use. The antenna could be directly on-board, but then would not be amplified. Having a amplified GPS antenna is an advantage. Therefore it may be best to strip down an amplified antenna to reduce weight and mount it off-board. This also allows it to be located away from other electronics. The main board pattern could allow for on-board non-amplified or off-board amplified options. Three mosfet outputs from the flight controller to drive a high power red/green/blue LED. Depends on Multiwii configuration. These connector allow for easy firmware updates and replacement of the Arduino bootloader when needed. This is a way to gracefully end a flight with little or no risk to anything on the ground and minimal or no damage to the model. It can be used when something goes wrong with the planned main landing site. Can be manually controlled or automatic (in the case of a lost model or flat battery). Flight Mode – this takes the model to a known safe location (GPS coordinates). Like RTL but to another GPS location, pre-set before launch. Automatic flight termination – the plane loiters over the safe location until battery level drops to say 10%. The motor stops, control surfaces zeroed and a small parachute released. This causes the plane to descend flat at a reasonable/safe speed to the ground. If triggered by selecting the flight mode, the plane flies to the secondary landing point and lands. If immediate termination is selected, the plane performs the landing procedure right away. Typically used at the originally planned landing location. This allows a safe vertical landing of a reasonably fast wing. Falling flat and with the parachute, descent speed will be low enough to present no danger to people or property on the ground. Hopefully and if planned properly the model drops in a clear field or light scrub. One of our standard 6-channel LED flashers build directly into the main board with dedicated BEC and LED resistors. This provides high intensity LED orientation and beacon indicators. LED mode and on/off can be controlled by the pilot via the flight controller and flight modes. LED placement will be wing-tips, centre-top, centre-bottom and leading edge landing lights. There are 2 sets of landing lights, a pair of 3 watt IR LED spot lights, and a set of 3 watt white LED spot lights. See the LED controller pages for details. This is standard FPV tracker beacon built directly into the main board. It monitors the aileron channel from the flight controller. See the tracker pages for details. To consider – camera failure triggers return to launch ?? Plugs into the main board. A small camera must be used to fit into the wing leading edge and be easily waterproofed without distorting the image. Two FPV cameras, one in each wing provide balance and day/night capability. A video-switcher based on light level is a possibility; not sure yet. One camera with IR filter and one without the IR filter. Auto switching would have to detect light level and delay switching to prevent annoying toggling between day/night. A separate stand-alone micro would be the most simple. Audio is provided with a microphone on the main board. An audio feed from the OSD can be mixed in to provide a basic vario function. I like the audio feedback of motor sound etc. A good indication that everything is OK, or not. An audio feed from the payload can also be sent back on the FPV audio channel. This could be mixed with the mic and vario, or instead of. Three preset volume controls could set each level before flight. 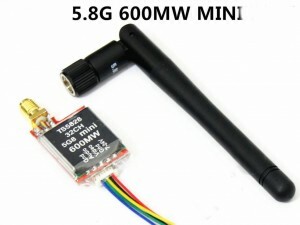 The flight controller can turn the FPV transmitter off/on. For example: when returning home. Why not use the minim-OSD, which is a nice unit and quite configurable, rather than the simpler DIY-OSD built directly into the main board. Minim-OSD needs to be configured, DIY-OSD is up-loaded and ready to go. Based on my previous notes, the DIY-OSD works with GPS data at 38400 baud. This allows it to piggyback on the flight-controller GPS data which must also be set to 38400 baud. The serial port must be jumpered or configured to allow GPS and Bootloading on the same port. A 200mW to 600mW 5.8GHz transmitter attached to the main board. Ebay: TS5828 5.8Ghz 32Ch 600mW. Ebay: TS5823 5.8Ghz 32Ch 200mW. I suspect that to achieve 32 channels, the larger chip on the back is a micro that configures the TX module via I2C based on the DIP switch settings. remove and place just the tx-module, micro and DIP switch directly on the main board. The first is probably easier, but slightly heavier, not as elegant and a messy mount considering the odd connections on the standard V-TX. Designing the main board to accept the major components from a standard V-TX simplifies assembly and reduces weight, but would require a board design change if the modules became unavailable. I am still considering this. It’s a nice idea, but my be an unnecessary complication, at least for version-1. Another concern is camera failure taking out the OSD. No sync and the OSD is useless. A simple sync generator could kick in and retain instrument flight capability. It is basically just another micro fiddling with the video signal, a bit like what the DIY-OSD does. Changes to the video sync before the transmitter and a correction after the receiver effectively prevent eavesdropping using standard AV receivers. Not encrypted or secure, but enough to make the video signal no longer obvious and not . The FPV video antenna would be a cloverleaf on top of the model, oriented to be horizontal when in level flight. An open wire antenna for minimal drag. The RC antenna would be a 1/4 wave dipole central on the trailing edge. The lower half ideally spring loaded to get out of the way on landing. Will have to make sure this doesn’t interfere with payload drop. The GPS antenna will be a large-ish ceramic patch towards the centre-top of the main board. This allows the top shield if installed to act as a ground-plane and to some extent screen the antenna from signal originating from below (on the ground). The thought is to minimise the effects of GPS interference. The plan is to make the main board as small and light weight as possible without using exotic parts or getting too extreme with design complexity. A board of 150×100 mm that is low cost and easy to produce using readily available parts is much better than than one a quarter the size, using single-source more-costly parts and requires specialist assembly. Parts must be generic, multi-sourced, low cost, and available in small quantities in common packages. The board must be simple enough to assemble in small quantities and cheap enough to be able to be lost without major concern. The board will be a simple 2-layer design with small SMD parts on the top and modules on the bottom. The top can be paste masked and reflowed, the bottom can be hand soldered. This includes battery connections, power control and monitoring, and voltage regulators. Two 3S LiPo batteries are connected using soldered short and light-weight wiring directly to the board. One battery to each side of the board suits the flying-wing configuration and reduces wiring. Considering the small size and generally lower currents, JST red connectors could be used if the batteries needed to be removable. This uses a 100A n-channel power mosfet in the -ve rail. A p-channel mosfet in the +ve rail would be easier, but less power efficient. The RDS-on of a n-fet is significantly lower than a p-fet and n-fets are more robust/reliable. The power control circuit must be reliable. If it fails or shuts off mid flight, all control is lost. A PIC12F675 controls the main power on/off. The PIC operates at 2-5V but gets its power from the 6 cell battery, 20-26 volts. The PIC runs slowly and spends most of its time asleep. Power is supplied through a bleed resistor onto a capacitor to maintain the sleep state. On start-up the PIC bypasses part of the bleed resistor to ensure enough current to run. This minimises current draw from the higher voltage supply when asleep. Another problem is the ground/common potential difference between the PIC and the rest of the flight controller – because the power switch is in the ground rail. The difference can be almost zero when on or the full battery voltage when off. The simplest way to overcome this is to use a opto-coupler to allow the flight controller to turn power OFF. Current is monitored using a low-R shunt in the +ve rail, and op-amp circuit. This is a bit more complex than using a dedicated current sensor, but uses generic parts and does not tie the design to one manufacturer. The 0-5V output representing current is fine tuned using a voltage divider dropping to 3.3V peak for the micro-ADC. Voltage monitoring is simply a voltage divider and op-amp buffer providing 0-5V and then a voltage divider dropping to 3.3V peak for the micro-ADC. The ESC is a standard Hobbyking Turnigy Multistar 30A, stripped down and mounted on the top of the main board (due to increased height and cooling requirements). There was no special reason for this choice, other than, 6S rating, low price, small size and availability. This is a opto-esc, meaning there is no BEC on board. All voltage regulators are miniature switch-mode modules.